No matter what ecommerce platform you use for your online store, ensuring that every webpage is search engine optimized makes a huge positive impact. 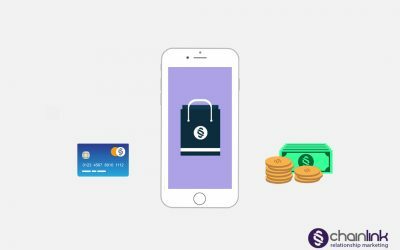 Shopify is one of the most popular and user-friendly ecommerce platforms available, with built-in SEO features to help store owners easily optimize their content. 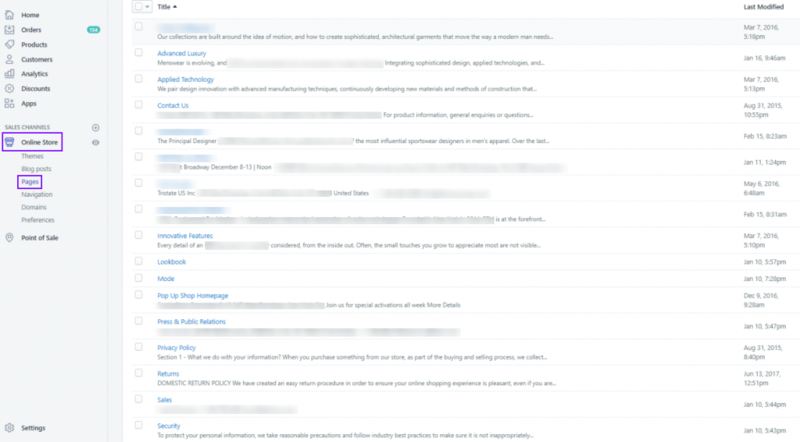 Without guidance, it’s also just as easy to overlook some of the most important parts of optimizing product pages. Although Shopify has some great how-to resources, we wanted to simplify the main steps for you so you don’t have to sift through their content to find the instructions you need. 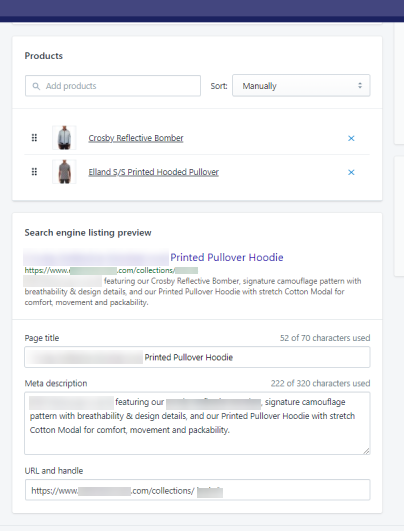 This article will walk you through how to optimize the pages in your Shopify store so your website can rank higher in search engine results. 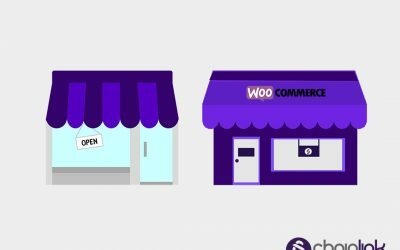 If you are familiar with the WordPress Plugin Yoast, you might be disappointed that there isn’t a built-in SEO checker for Shopify. 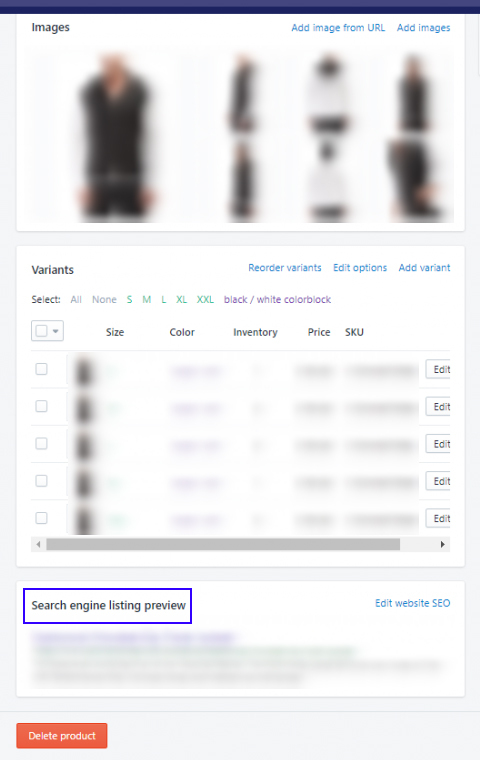 However, at the bottom of every collection page, product page, blog post, etc., you’ll see “Search engine listing preview”. 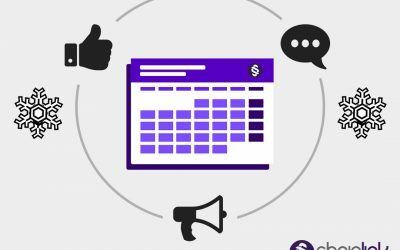 This is the key to on-page SEO for your Shopify store. Assuming you’ve already done your keyword research, you need to focus on including the appropriate keyword in the title, description, SEO title, meta description, URL handle, and image Alt text. 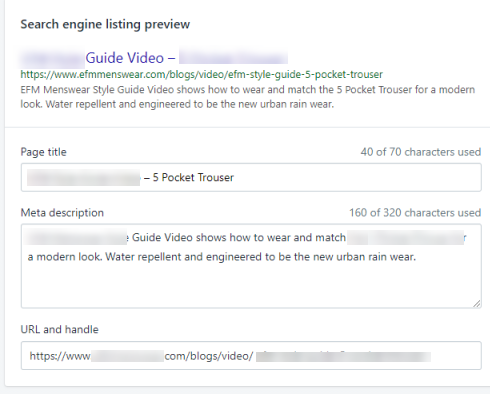 You can accomplish the same thing Yoast would do if you properly edit the “Search engine listing preview” section, making sure to include the right keywords in the right places. 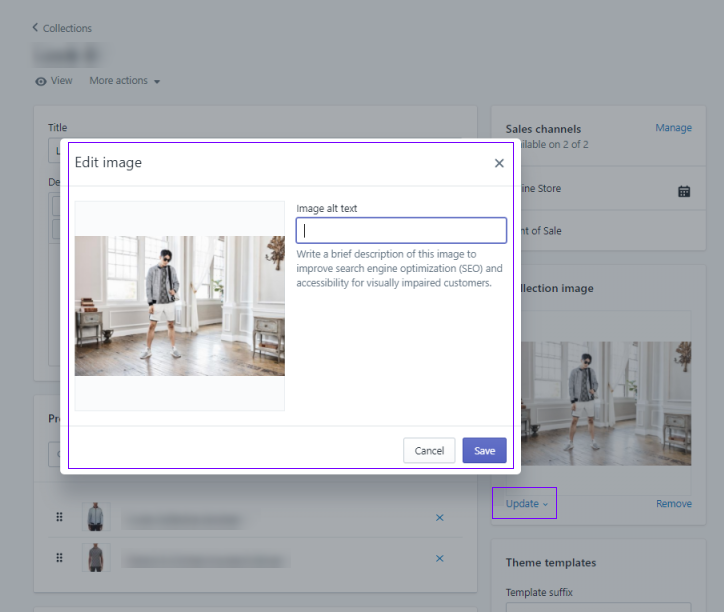 Whether you have 10 products or 500, you need to make sure every single product title, meta description, and image Alt tags are updated appropriately. Even if you have two extremely similar products, it’s critical to make sure every product page is unique. Unless you’re a huge brand with thousands of products in multiple colors/patterns (like H&M), it’s best for SEO to have a separate page for every product with a slightly different variation. When you write the SEO title, be sure to differentiate the products accordingly. 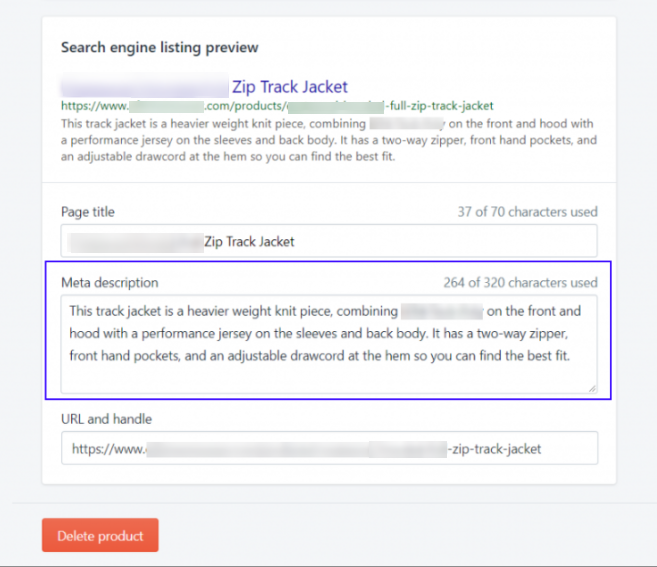 For example, if you have two identical track jackets in different colors, simply add the color to the end of the SEO title. Simply adding the word “Navy” to the SEO title to distinguish the color makes your page more SEO friendly. In the same way, you want to ensure that every product meta description is unique. Let’s use the track jacket again for this example. You can rephrase the sentences of your entire meta description. However, simply adding “pictured here in navy” as the last sentence would effectively differentiate the product to search engines. Since meta descriptions are the snippets of text that appear under your SEO title, you need it to be captivating (or at least coherent). Too often, store owners or employees rush to upload products and neglect these snippets. Also, it’s very easy to exceed the recommended meta description character limit if you’re not diligent. Stick to 320 characters or less to be in accordance with best practices. The Image Alt Text should match the SEO Title plus whatever else you want your image to be found for. Most brands include their company name in every Alt text, which is recommended for trying to increase visibility in image searches. Going back to our navy track jacket example, let’s say the brand is Adidas and it’s specifically a part of the brand that sells running clothes and shoes. If you have multiple photos of one product on the same product page, make sure the Alt text of each image are the same. 1) It enhances the overall SEO visibility of your products and pages. 2) It allows users to actually search for your products using Image Search. 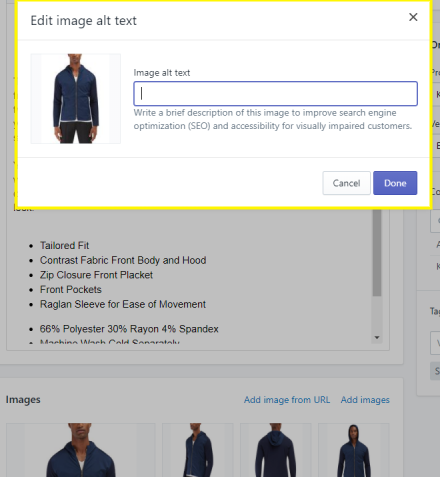 Image Searches like Google Images are extremely valuable, so that your products will actually show up if someone searches, “Adidas Zip Track Jacket”. You want to make sure to apply the same rules for Product Collections, making sure that all SEO page titles, meta descriptions, and Alt text are properly filled out. Whenever you add new product collections, make sure the same SEO elements are updated for each. Similar to the Product pages, the more descriptive the titles and the meta description, the better SEO visibility & higher likelihood someone searching for your products is to click through to your products and collections. Additionally, if you’re only updating Collections but not publishing new ones, you need to make sure your meta descriptions match the same. Otherwise, search engines anf users will click to your pages based on the content (it won’t match the meta descriptions) and then website visitors will quickly leave the site because of the page/product/post not matching their expectation from the search results. Google will take note if users are constantly exiting your site right away, and a high bounce rate makes Google think you have a poor user experience. Therefore, making sure your meta descriptions and titles are accurate for your Collections is super important. Note that the fields for updating Page title, meta description, etc. look the same as they do for the product pages. You can edit the image Alt text by clicking “Update” and then “Edit Image”. Don’t forget about optimizing the rest of the webpages in your online store besides the product related pages. Your online store should have additional pages such as your Home page, About Us page, a Contact page, maybe a page dedicated to your Shipping and Return Policies, etc. You need to make sure your SEO is managed site wide. You can optimize the SEO section for your home page by clicking the “Preferences” section under “Online Store” under “Sales Channels”. Don’t neglect the other pages on your site, because they play an important role in SEO, too. 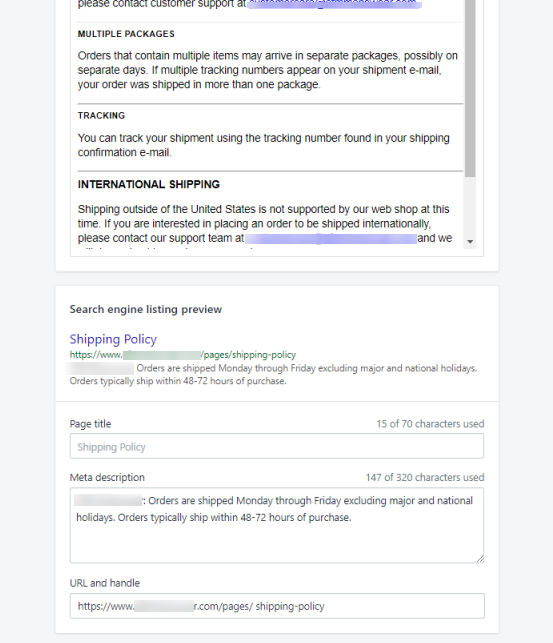 You need to make sure these pages are optimized in the backend of Shopify. You can see the pages you need to optimize by clicking “Pages” under “Online Store”, under “Sales Channels”. Use the exact same logic for optimizing your other web pages as you would for optimizing your product pages. When you click on any of the pages, the same optimization options (SEO title, meta description, image Alt text, etc.) will be available to update. The same types of optimization guidelines apply when making sure your blog posts have updated SEO. 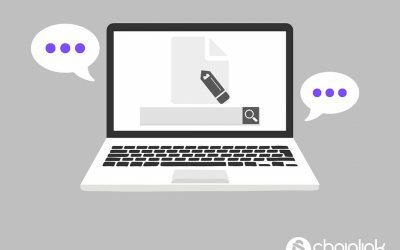 You want to ensure that each SEO title and meta description is unique and descriptive of what’s in the blog post or video. 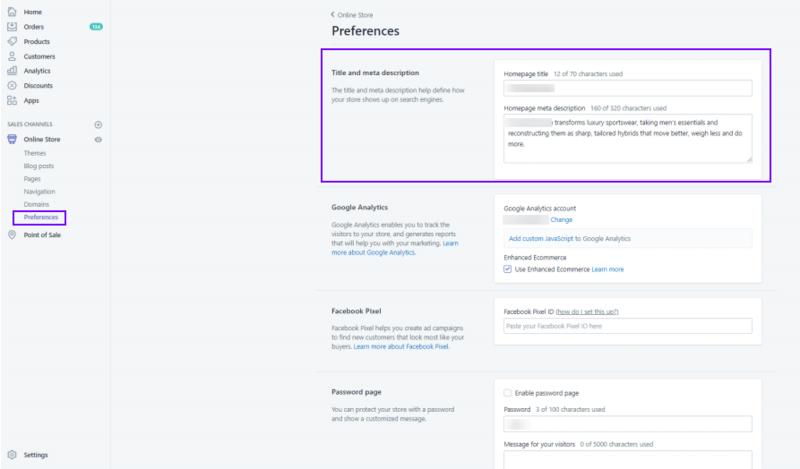 The same rules should also apply if you’re updating a post versus if you’re creating a new post. If the content of the post (the video) has changed in any way, be sure to update it so the title and description are matching accordingly. Don’t forget that your website’s speed, mobile friendliness, social media presence, and off-site SEO efforts like linking building are also huge factors contributing to your ecommerce store online visibility. With the right information and attention to detail, anyone can optimize their on-page SEO and reap the benefits of optimizing products. As SEO experts, we want to help ecommerce companies increase their sales using optimization. Our technology-first approach helps our clients rise above competitors in a fast-paced and competitive digital marketplace. We can also provide valuable insights into your customer histories, interactions, preferences and purchases using our proprietary platform, the Chainlink Marketing Platform. Want to learn more about what Chainlink can do for you?